If you read any reviews about binoculars, there is a good chance you will see Minox near the top of those lists. Especially if you are into wildlife viewing and hunting. These are by far one of the best sets of binoculars for that type of activity. They are an impressive pair of binoculars and if I had to rate them they would be very close to a 10 on a scale of 1 to 10. The construction of these binoculars is second to none. Water and fog ain’t got nothing on these babies. While you are out in the wild you will never have to worry about your binoculars getting water inside of them or fogging up. These binoculars are tough and can handle just about anything you throw at it. These binoculars are also very light weighing only 22.9 ounces. They are without a doubt one of the lightest pair of binoculars I have ever reviewed. And besides being lightweight, they are also very comfortable to use thanks to a neck strap that is both well made and well padded. So even if you have to carry them around with you all day, which you will if you are out in the wild, they won’t weigh you down. Now lets talk about the image quality you will get with the Minox 8×43 APO binoculars. When it comes to image quality and the quality of the optical components, these binoculars rank very highly. No matter what’s going on you can be sure the quality of the image will be very high. You will be able to fully enjoy all of the beauty the wildlife has to offer. One thing I think you will really appreciate is the binoculars ability to produce great images even in low light conditions. You may not think this is a big deal but it really is. This feature makes objects stand out more and have a three dimensional look and feel. This makes it easier for you to spot things such as a deer or other animal when you are in an area that is thick and forested. You will even be able to see small birds through the trees. Image brightness is also a great feature. So not only will you get great image quality but you will get great image brightness as well. The average pair of full sized binoculars have a 42mm objective lens. 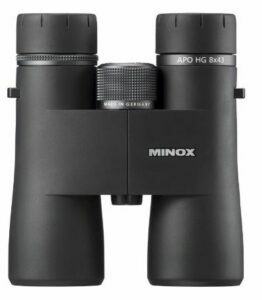 The Minox 8×43 APO binoculars have a 43mm objective lens. While not a huge difference in size, it has a huge impact on the brightness of what you see. The difference allow this pair of binoculars to capture more light. When you combine this with the amazing optics and really great coatings you get a really bright image. I think you will be pleasantly surprised at how great the images look through the lens. And the best part is you get those same bright images no matter what time of day it is and no matter how poor the light conditions.